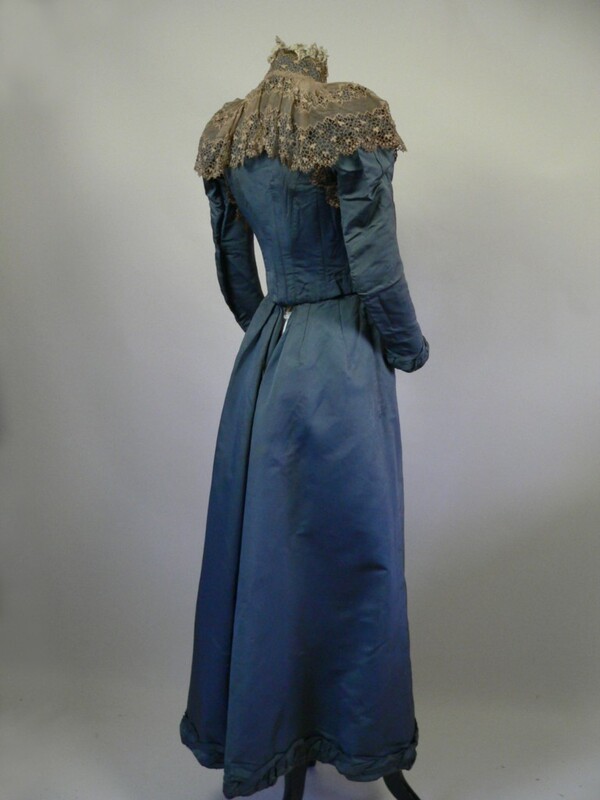 A stunning original late 19th century suit in blue grey silk grossgrain, trimmed with crochet lace in beige and cream. 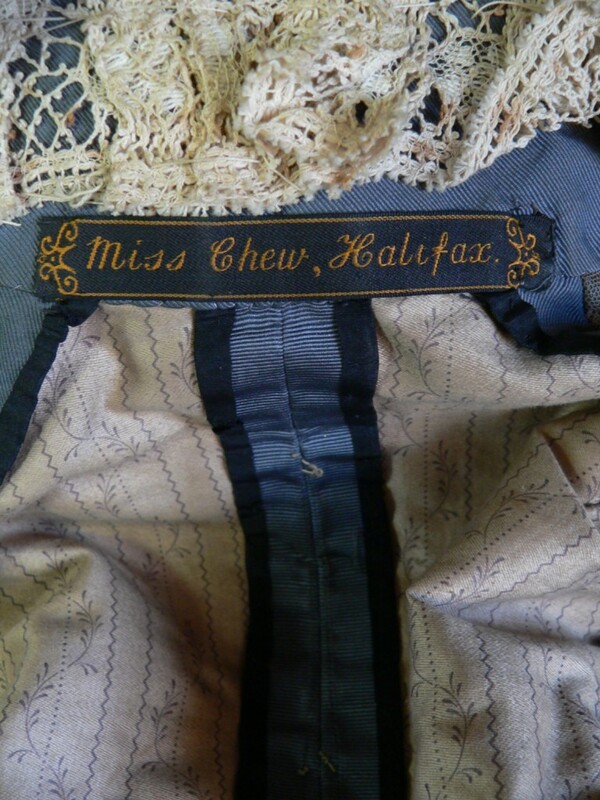 Labelled twice to the interior of the bodice 'Miss Chew Halifax' and on the petersham band 'Miss Chew - Modes et Robes, Halifax' the dress is an oustanding example of its type and is in good strong condition. Beautifully constructed, the boned bodice is lined in floral cotton, the boning secured by bright red stitching for dramatic effect. 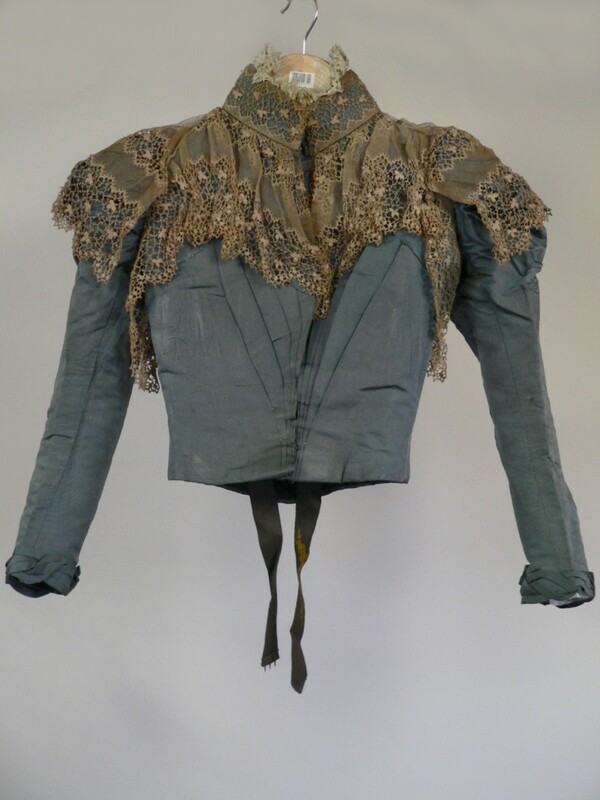 The bodice closes with a series of hooks and eyes to the front with the cuffs mirroring the hem of the skirt and decorated with an interlaced folds of fabric. The skirts close to the back with hooks and eyes and is lined in a glazed beige cotton fabric. 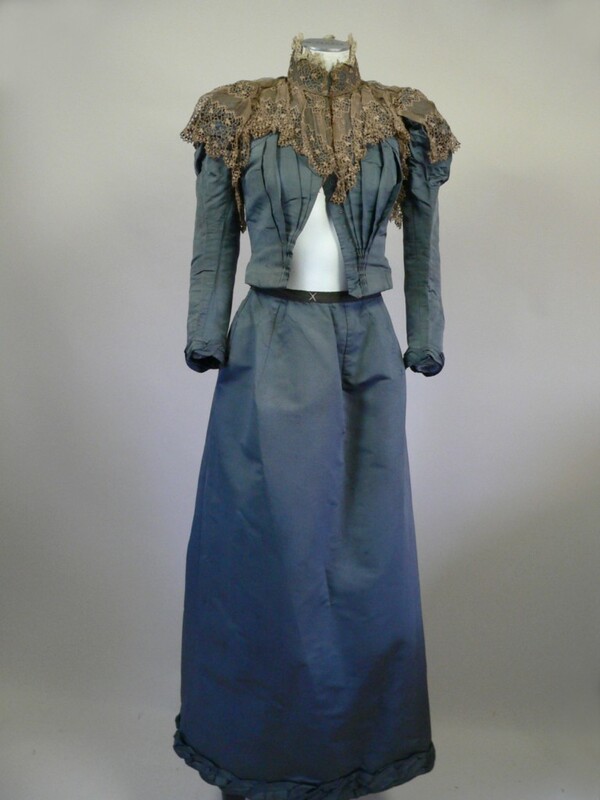 The waist of the skirt and jacket measure an eyewatering 22 inches (too small to close on my mannequin). Very good sturdy condition. 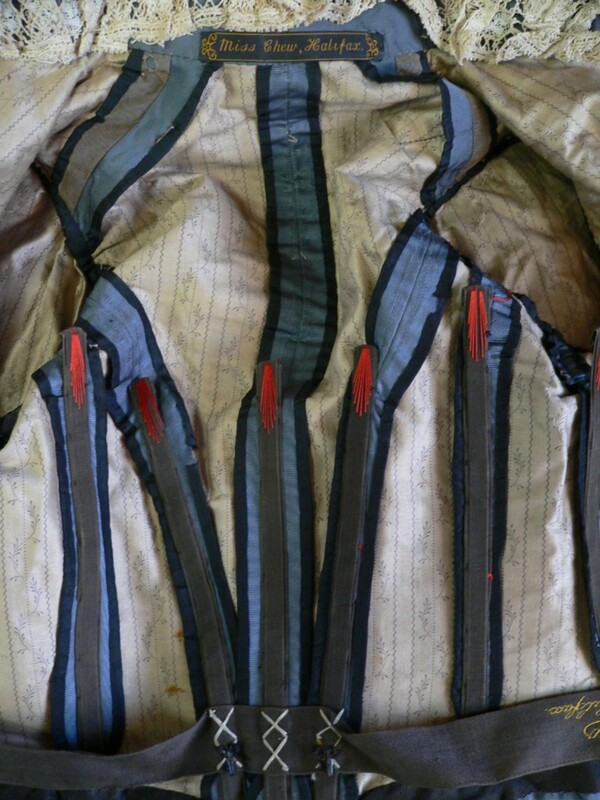 The fabric a little grubby in places with modest marking to the underarms (not seen when worn). Some scattered small marks to the skirt including a small watermark to the mid front, but the fabric is strong with no shattering. The hem a little grubby from contact with the ground. 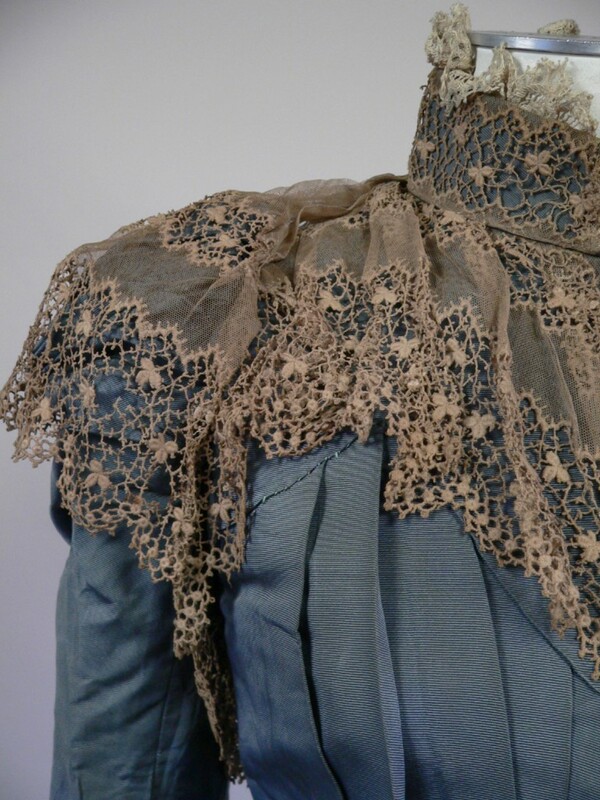 Interestingly the crochet lace work to the shoulders is not discoloured but remains the original mid beige tone as designed. This must have been stunning in it's day. It's too bad the blue faded so much.